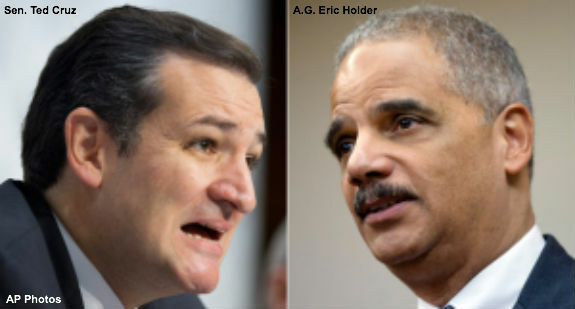 Senator Ted Cruz had strong words for Eric Holder today on the Senate Floor, as he laid out reasons why Eric Holder should face impeachment over the ongoing IRS targeting scandal. Cruz stated that if Eric Holder, who appointed a deep-pocketed Obama donor to investigate the scandal, does not appoint a non-partisan special investigator, that he should be impeached. Go here to view Cruz’s Senate Resolution 487 , which would force Holder to make the appointment of a special prosector. Likewise, that very same day that Inspector General report came out, Attorney General Eric Holder that the IRS targeting of conservative groups was “outrageous and unacceptable.” That was more than a year ago. What has happened in the year and two months that has passed since then? Although both the President and Attorney General profess outrage and anger, not a single person has been indicted. Although the President and Attorney General have said they’d investigate this matter, it has been publicly reported that no indictments are planned. In Fact, President Obama went on national television during the Super Bowl and categorically stated that there was “not even a smidgeon of corruption” to be found at the IRS. How far we had gone from the day the scandal broke when he said he was angry and the American people had a right to be angry. Fast forward a few months later and he goes on television and says there’s not a smidgeon of corruption. Now that is a remarkable statement for the president to have made because the Attorney General four days earlier had told the Senate Judiciary Committee that there was an ongoing investigation being conducted at the IRS. President Obama’s comments and Attorney General Holder’s comments are facial inconsistent. Either Eric Holder was telling the truth that there was in fact a meaningful ongoing investigation, or President Obama was telling the truth when he said that conclusively there’s not a smidgeon of corruption. One or the other was not telling the truth. Or perhaps President Obama was just prejudging the investigation.